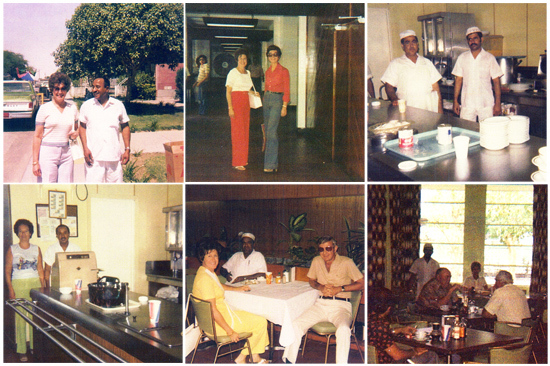 Saturday, October 16th, 1976, Oran flew back to 'Udhailiyah for the start of another work week. Our lives were just settling back into a normal routine, and we were taking things one day at a time. Things came up at work every now and then that could have had an effect on what we did about staying, but so far Oran just remained calm, and didn't give an answer or reaction until he had thought about it for awhile. His bosses didn't exactly know how to take that, and neither did I, really. I was just holding my breath, hoping nothing would happen to make Oran change his mind, but nothing would surprise me anymore. Although momentarily happy, I felt like we were just in a kind of holding pattern. We still went to the pool most weekends, but mostly to sunbathe now. My tan was beginning to fade, but it had been nice while it lasted. We also walked to the ballfield to watch the women's team Vicky had played on the nights they were scheduled to play. There were just three women left that had been on her team, Judy Elkins, Rosa Bombe, and Laurie Swanson. They said they could have used a good hitter like Vicky that year. Oran came home on Sunday afternoon as he had a doctor's appointment on Monday morning, October 18th, 1976. That was the day we girls had scheduled and prepared our yard sale. I went to Kathi's about 8, thinking I was right on time, but people were already there in droves to buy, and things weren't even totally set up yet. Marge was already there, so we had to get into high gear, marking and setting things out hurriedly, and taking money at the gate. It was a mess for awhile. Then the others arrived, and we were all busy the rest of the day, but it was fun. Shoppers didn't slow down until it got dark, and of course, they wanted to bargain about every item. We held out until late afternoon, then started bargaining to get rid of everything. The Arabs loved that. Oran and some of the other husbands had come over later in the day to help, and we started drinking frozen daiquiris, then practically gave everything else away. As a lot of our get-togethers did, it turned into a mini-party when the sale was over. We related the day’s events to our husbands. These included the humorous incidents, such as having to try and explain to an Arab man what certain female articles of clothes were used for. All in all, we considered the sale a tremendous success. I made 450 riyals, roughly $130.00 at that current exchange rate, and I didn't even have very many things in it. The others made a lot more, especially Kathi. I had to rest up from that the next day, then on Wednesday I went to a desert-bridge party at Vonnie Rhodes. Oran was home from 'Udhailiyah already when I got home, so we sat on the porch, then went to meet the Kings, Williams, and DeSantises at the Dining Hall for shrimp. We went by the Post Office after and had received some tapes and snapshots of Vicky's survival trip. Oran drove Marge DeSantis and I to Al-Khobar in her Fiat the next morning as Chris wasn't available, and women were not allowed to drive outside our camps. On the way we played Vicky's tape on the tape deck, and looked at the snapshots of her survival trip at the same time. It was really nice to be able to listen and see where she was and what she was doing at the same time. It helped make the trip to Al-Khobar more enjoyable, for us anyway, and Marge seemed to enjoy it, as well. After Oran flew back to 'Udhailiyah Saturday, he called to say that he had been told he could transfer out of Water Injection as soon as he could train Hazzar, an Arab working with him, on the Amine Plant. He discussed everything with his bosses and decided he would be able to do that by the 1st of January, at the latest. So, here was something tangible we could look forward to at last. Sunday morning, I went to the Dining Hall to meet Kathi, Sandy, and Johonna Verhoven for breakfast. We all decided we liked the weekly breakfast get together, so decided to start a club and try to get together every week on Saturday morning, if possible. That way we could plan our week's activities and have something to look forward to. It would also include Marge Williams and Sheila Kaul, in essence, the original foremen's wives. Johonna's husband, Janus, was not a foreman, but he did work in the Water Injection Department. Actually, it turned out to include anybody who showed up at that time, and on different days of the week. The more, the merrier. Abqaiq Dining Hall: Colleen and the Dining Hall Supervisor; Colleen and Johanna Verhoven at the entrance to the dining room; two regular workers; Estella Syphers and the cashier in the dining room; Colleen, Oran, and a worker; general group in the dining room by the window. Later that afternoon, Sandy, Kathi, and Johonna came over to my apartment about 4:30. Oran came home from 'Udhailiyah, then Jack came over, then Harvey Pederson. He just stayed a short time, though, as he was saying goodbye to everyone before leaving to go to the airport to leave Arabia for good that night. He became the first of the original foremen of the Water Injection Project to leave Arabia. As far as I know, none of our group ever heard from him again. When Oran flew back to 'Udhailiyah Tuesday morning, I walked to the Cash Office to deposit some bowling league money, then stopped at Kathi's on my way back home. She and Marge Williams were just driving up in Marge's new Volkswagen. We started to have tea, then decided to go to the Dining Hall again, which was fun. That afternoon, we met at the pool to enjoy the extremely nice weather, which was almost a perfect temperature at that time of year. There was to be a Halloween Carnival on the Recreation Clubhouse Patio Thursday, October 28th. That morning, at the Dining Hall, Oran and I saw Sandy and her kids just finishing their breakfast, so we sat with them. Afterward, we all walked out onto the clubhouse patio to see the preparations for the carnival and to look over the cake walk area in the East West Lounge that our Sorority would be in charge of. Every member was to bring two cakes and helping out during the carnival. Back at our apartment, I baked my cakes while Oran ran some errands. At 4 o'clock, we took the cakes and went back to the clubhouse patio where the carnival was getting started. I helped run the cake walk for the first couple of hours, and it was a lot of fun. Some of the Arabs were really funny to watch, as they had never before, in their lives, seen or been involved in a cake walk, but they loved it once they caught on, and were good at it. It turned out to be one of the most popular attractions at the carnival. After my duty, Oran and I walked around, looking at all the booths and activities, ate hot dogs, then went back to help some more in the cake walk. Oran and the other husbands helped too, of course, and when it was over, Kathi invited us all over to her house for, you guessed it, cake and coffee. These special events over there always drew big crowds, Americans and Arabs alike, and even though our children were no longer small, we could still participate in a favorite children's holiday. The next week started with our breakfast "club" meeting at the Dining Hall, but Marge Williams and I were the only ones there that time. After our meal and talk, we went by Kathi's to get a Cosmopolitan Magazine that someone had managed to sneak into the country (it was a banned item), and a jewelry catalogue she had gotten from Doris Kent. On Sunday morning, October 31st, we had more luck with our breakfast "club". Marge, Harriet Fretwell, and I were there, and Kathi came by to join us. When we finished, we all drove by my house in Marge's Volkswagen. We were enjoying having transportation for a change, so we drove by Sandy's, then Sheila’s, then to Sharon Greens to look at our Sorority pictures. It had been a very full morning. As that night was actually Halloween and there would be trick or treating, Oran came home from 'Udhailiyah and we sat out on our porch, passing out Halloween candy to the kids. There were some really good and imaginative costumes, as you couldn't just go to a store and buy one over there. Most mothers put in a lot of time and effort making one for their children. There were beginning to be some Arab families living in our camps, as well, so the Arab children were getting into the act and they loved it. As if right on cue, it turned cold for the first time the next day, Monday, November 1st, 1976. Oran flew back to 'Udhailiyah, but I woke up with stomach cramps, stayed in bed all morning, then made an appointment with the doctor for 1 o'clock. I felt better by the time I got there, but got my regular little sack of medicine at the pharmacy you were always given for whatever ailment you had. He thought it was a gastritis attack, which was not unusual occasionally over there. I still got a substitute to bowl for me that night in the mixed doubles league. The next day I was feeling much better, so I went with Sheila to the Post Office around 4 o'clock after she came by to visit, where I ran into Bob Howie, my bowling partner. That was the first time I had seen him since his holiday to Scotland, so we talked awhile. Oran's plane couldn't land in Abqaiq that evening because it had been late getting to 'Udhailiyah to pick up the men. So it was too dark by the time it flew back to the Abgaiq airstrip, and there were no landing lights. They had to fly on to Dhahran, and bus back home. So Marge and I went on to the Kaul’s then to the Dining Hall with the rest of the gang for dinner. Oran and Marvin finally arrived to join us. I took the cake pans I had borrowed for the cake walk back to the DeSantis' Thursday morning. Herb and Lucy Englehart were there helping Marge and Chris make Lasagna for Verhoven's going away diner party the next weekend. They had decided to return to Holland. Ray Branch, the department manager, came by while I was there to talk about the party, as it would be at their house. Later Oran and I went to the pool for awhile, then to an art show at the Golf Club House, but just sat on our porch that evening, enjoying the pretty weather. He said he had been thinking about the possibility of our going home for our Christmas vacation again that year. His training of Hazzar was going well and he thought that would help a lot until his transfer. That sounded great to me. Oran started feeling bad with cold symptoms the next morning and thought lying out in the sun awhile might help his condition. So we went to the pool again, but he was feeling worse and worse, so we just went back home. There was to be another performance and dance that evening in the Golf Clubhouse by Johnny Tillison's Group. Oran insisted I go on to that with Estela and Bill Syphers and Avonie and Bob Long, who had invited us to join them, so I did. But it didn't turn out well, as there was hardly anyone there. We enjoyed each other’s company and the performance, though.